Secure computations on big data call for protocols that have sublinear communication complexity in the input length. While fully homomorphic encryption (FHE) provides a general solution to the problem, employing it on a large scale is currently quite far from being practical. This is also the case for secure computation tasks that reduce to weaker forms of FHE such as “somewhat homomorphic encryption” or single-server private information retrieval (PIR). 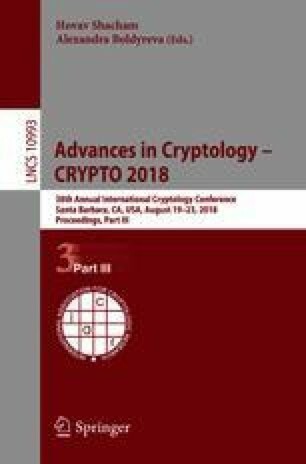 Quite unexpectedly, Aggarwal, Mishra, and Pinkas (Eurocrypt 2004), Brickell and Shmatikov (Asiacrypt 2005), and Shelat and Venkitasubramaniam (Asiacrypt 2015) have shown that in several natural instances of secure computation on big data, there are practical sublinear communication protocols that only require sublinear local computation and minimize the use of expensive public-key operations. This raises the question of whether similar protocols exist for other natural problems. In this paper we put forward a framework for separating “practical” sublinear protocols from “impractical” ones, and establish a methodology for identifying “provably hard” big-data problems that do not admit practical protocols. This is akin to the use of NP-completeness to separate hard algorithmic problems from easy ones. We show that while the previous protocols of Aggarwal et al., Brickell and Shmatikov, and Shelat and Venkitasubramaniam are indeed classified as being “practical” in this framework, slight variations of the problems they solve and other natural computational problems on big data are hard. Our negative results are established by showing that the problem at hand is “PIR-hard” in the sense that any secure protocol for the problem implies PIR on a large database. This imposes a barrier on the local computational cost of secure protocols for the problem. We also identify a new natural relaxation of PIR that we call semi-PIR, which is useful for establishing “intermediate hardness” of several practically motivated secure computation tasks. We show that semi-PIR implies slightly sublinear PIR via an adaptive black-box reduction and that ruling out a stronger black-box reduction would imply a major breakthrough in complexity theory. We also establish information-theoretic separations between semi-PIR and PIR, showing that some problems that we prove to be semi-PIR-hard are not PIR-hard. The first author was supported by ISF grant 1861/16, AFOSR Award FA9550-17-1-0069, and ERC grants 307952, 742754. The second author was supported in part by ERC grant 742754, ISF grant 1709/14, NSF-BSF grant 2015782, and a grant from the Ministry of Science and Technology, Israel and Department of Science and Technology, Government of India. The third author was supported by NSF grants 1617676, 1526377 and 1618884, IBM under Agreement 4915013672 and the Packard Foundation under Grant 2015-63124.